This book was a project born out of necessity. 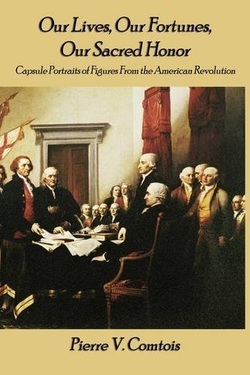 As a long time reader of American history in general and the Revolutionary period in particular, I have always been interested in the Founding Fathers many of whose long and diverse careers fascinated me not only for their personal accomplishments but also for the way they seemed to intersect with one another. One Founder was personally acquainted with a number of others who in turn knew other Founders who in turn had met members of the first group. This tight circle of friends and colleagues was made possible because of the relatively small population of the infant United States and the even smaller circle of national and state leaders among whom the Founders moved. Thus Paul Revere knew Samuel Adams who knew John Hancock who knew George Washington who knew Alexander Hamilton, etc. The problem was that in pursuing my interest in these Revolutionary figures, I found that aside from the biographies of such major figures as George Washington, John Adams, and Thomas Jefferson, and brief character sketches of others, personal histories of the more obscure Founders, including many of those who signed the Declaration of Independence, was completely lacking. Until the arrival of the internet, detailed information on many of those lesser known individuals was just not to be had for the casual history buff. And so, after many years of scouring bookstores looking for that handy but elusive single volume compendium of biographies, I finally came to the realization that if I wanted a book like that, I would have to write it myself. But in embarking on the project, it had never been my intention to write a book based on original research involving digging into archival sources and unpublished letters. As a result, the following work is the end product of readings and delvings into a number of published sources from available books to the internet. What makes the “capsule biographies” I have written different however, is that the information on each subject was pulled from numerous places, collated, organized, and otherwise pieced together in a hopefully coherent whole for the interest of the general reader. From the beginning, there was no question that the subjects to be covered in the book would consist of all the well known names from the American Revolution: James Madison, Benedict Arnold, Benjamin Franklin. The difficult decision was in choosing who among the lesser known Founders to include and as I researched each subject, more names would come to my attention. I ended up writing over 120 separate entries and that by no means exhausted the potential for more but I had to draw the line somewhere. Adding to the difficulty of choosing whom to include, was my own rather broad interpretation of the term Founding Father. Some might restrict the term to a select few Revolutionary leaders such as those who signed the Declaration of Independence, or who served as officers in the Continental Army, or who framed the Constitution, but my definition of just who is deserving to be counted among that group is more inclusive:namely, anyone who participated even in the smallest way in the struggle to make America free, from the lowliest private in the Continental Army to the Indian fighter on the farthest edge of the frontier to the diplomat serving in Europe to the selectman working to meet his town’s quota of supplies for the army. And so, taken from a personal evaluation of the Founders as figures from the country’s lost heroic age, my approach is admittedly an eclectic one including those men commonly accepted as Founders and others who have hardly even been heard from. Although this approach did not necessarily forbid the inclusion of less respectable aspects of the Founders’ lives, it also did not permit any judgment of their personal actions from a modern perspective. When it comes right down to it, the Founding Fathers were human after all, despite the seeming Herculean and outsize nature of their achievements. That said, this volume is not intended to glamorize the Founders; their often mighty deeds speak for themselves.